We're back once more in the world of NightwingTAS' theoretical Hawkworld animated series, starring the whole family of the Winged Wonders. Today's entry is something new, something different, so let's take a look and see how our new family member takes wing. "Mia never knew her mother was Kendra Saunders, let alone that she was Hawkgirl. Kendra gave birth to Mia when she was really young and gave her daughter up for adoption so she may have a better life. What Kendra didn't expect was that giving her up would lead her life into a downward spiral that included her trying to take her own life, which bonded her soul and her Aunt's to be bonded for years until the Blackest Night. During the Blackest Night, Mia found out who her birth mother was and decided to become her sidekick taking on the name Hawkling. Mia and her mom are starting to form a bond which is filling a space that had remained empty in both their lives." Interesting take on giving Kendra more of a family, and continuing the expansion of the Saunders/Sanders clans. Hawkling sounds like the kind of Teen Titans character which Golden Eagle was never going to be. My main problem is the ages. Kendra was always portrayed as a young woman; would she be old enough to have a teenaged daughter? Even if she had her early in life, I never pictured Kendra being even 30. So the ages get fudged a little bit here. I'm not thrilled with the midriff (again) but the blue is a nice color, a good compliment to all of the green and yellow, and it helps Mia stand out from the other designs we have seen so far. Her big spiked flail is a good weapon. It reminds me of Bruce Timm talking about how on Batman: The Animated Series they made a point to have Batgirl be a brawler and not use little dainty attacks. Same idea here, I think, as Hawkling doesn't get a sophisticated, subtle weapon, instead choosing a heavy bludgeon as her tool of the trade. In any event, I think this addition to the Hawk "family" is one which has some merit. The Hawks have, as I said, never really had a good Teen Titans aged member, and Mia here looks like she could fill that role nicely. The first preview of Savage Hawkman #0 is up and ready for your perusal! You can check it out over at iFanboy by clicking right here! The Savage Hawkman #0 Plotted by Rob Liefeld Scripted by Rob Liefeld & Mark Poulton Art and Cover by Joe Bennett & Art Thibert Color/32 Pages/$2.99 • Discover Hawkman’s connection to Thanagar and why he came to Earth! Big thanks to Honor Wings Bearer Matt Orr (follow @HawkmanFans on Twitter!) for making me aware of the preview! Image: Savage Hawkman #0, 2012, Joe Bennett. We're back for another installment of NightwingTAS' "Hawman Families" images, this time taking a look at the "modern" Hawkgirl, Kendra Saunders. How does she fit into this new take on the continuity? "Leading up to the Blackest night Kendra Saunders felt feelings for Carter growing, but was unsure if they were her own, or those of her Aunt Shiera. When the two were seperated and Shiera's soul was reunited with her body and brought back, Kendra realized that the feelings were her's, which conflicted with her feeling for Arsenal. During the Blackest Night, the Black Lanterns went after the families and loved ones of the heros which included Kendra's daughter Mia, who up until that point had no idea Kendra was her mother. " Visually, Kendra doesn't look that much different from Shiera, which is not surprising considering how much Shiera's modern look was based on Kendra's uniform. The main difference is the use of green over the yellow which was on Shiera's look. I would have given her a spear or other non-bludgeoning weapon, but that's just me. I do, however, like the gauntlets, a very Rags Morales touch for Kendra. As for her character... eh. I don't know how I feel about Kendra pining for Carter while he and Shiera are off being the premiere Power Couple on Hawkworld. It's an interesting take, but I never like female characters who are defined by how they feel about a man. Considering Kendra's frail mental state before her aunt's spirit inhabited her body, I imagine a reborn Kendra would be similarly troubled. There's stuff to mine there, I think, but it might be outside the scope of this project. Be sure to check out other Family posts today as well! Image: Hawkgirl, 2010, NightwingTAS, Image Retrieved from Super Buddies. The Comics Journal is usually a little high brow for me, but after some clicking yesterday and this morning I have come across this wonderful interview with the late, great Joe Kubert. Kubert goes into great detail about his career, including getting started asa pre-teen working for MLJ and Harry "A" Chesler. Because comic books is rather singular in that it allows you to take chances. It allows you to make mistakes. In a 16-page story, all of it doesn't have to be perfect. You can really go out on a limb and take chances. And, sometimes, those chances work great! And that makes you feel good. If it fails, fine. The majority of the effort does work OK. So it encourages you to take more chances and a lot of guys were able to do exceptionally good work in that way. Comic books also gives you a bigger canvas upon which to work. 'Cause when you're doing syndication or advertising, there are six guys sitting on your back giving their suggestions. "Turn this a half an inch," or, "Move this figure to the-left about three inches." That's what they' re getting paid for and that's what they're gonna do. But there isn't enough time for those small changes in comic books. So you had more freedom. To let your imagination run. I find that there is no other area in commercial art that allows you this kind of freedom. To design pages. To design complete books. To generate emotion into a story. It's a long read but definitely worth your time. 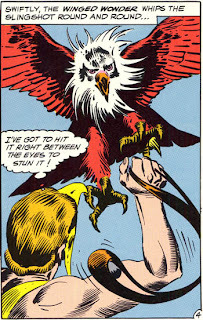 Image: Panel from The Brave & The Bold #36, 1961, Joe Kubert. Nicieza Not Writing Hawkman After All? More information in the ever-growing Savage Hawkman soap opera! When Rob Liefeld left all three of his DC books -- The Savage Hawkman, Deathstroke and Grifter -- many questions remained about who would be coming on board those titles next. Though the solicitation for The Savage Hawkman #15 lists Fabian Nicieza as scripter, Frank Tieri wrote on Twitter that he's "doing Grifter AND Hawkman. DC solicits have it wrong." Frank Tieri is a guy who's work I have enjoyed over on the Marvel side in years prior. He wrote a very fun, high energy run on Iron Man, and a really good Hercules miniseries. He also did a couple of arcs on a personal favorite modern series of mine, New Excalibur, along with a few excellent issues of Batman And The Outsiders in the intermezzo between Dixon and Tomasi. If this is true -- and honestly if Tieri claims he is writing Hawkman I am willing to believe it at this point -- then I am somewhat more enthused than I was for Fabian Nicieza. I am more familiar with Tieri's work and think that he has a good handle on writing action, which is a must for this series. He also has shown me that he is not one to make things too grim, which can be a problem, especially at DC lately. I think a Hawkman who has fun while he is on his adventures was what Liefeld was starting to turn Carter Hall towards, and I can see Tieri continue on that path. Do I think Frank Tieri is the long term writer on the book? Again I am going to say "no." I think that if this proves to be true, that as I suggested yesterday, Tieri will finish up "Hawkman: Wanted," and then a new writer (and possibly art crew) will come on afterwards. For now though, I'm just sitting back and enjoying the ride. GI Combat solicited it's final issue yesterday, which is disappointing, but there are lots of seeds being planted for an Eclipso return, so there is that. All things considered, I am still very much enjoying the New 52 and can't wait to see what is going to go down in "Hawkman: Wanted." We have another Hawk-related solicitation today, and despite being on a completely different vibrational frequency, they are both part of the same preview! • Who is Hawkgirl? The secret is revealed! • Mr. Terrific makes his first appearance on Earth 2 since he left our world! • Don't miss the aftermath of "THE GRUNDY APOCALYPSE!" I know I am way behind on the Earth 2 write ups (heck, I am still behind on my Savage Hawkman review for #12), but after the very subtle revelation at the end of #4, I am more interested than ever in discovering Hawkgirl's origin. That the other plots are continuing to build is further icing on the cake. This book has been a blast so far and I get the impression that Robinson is just cutting loose and having fun, and the result has been some really great comics. That Hawkgirl was among the first of the new "Wonders" to debut on the planet is a strong endorsement from Robinson as far as I am concerned, and so far she has shined in the scenes she has taken part in. 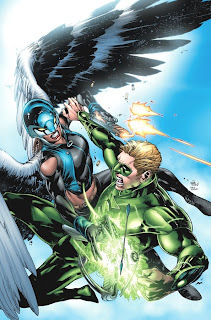 And I'll tell you what, our Winged Wonder certainly looks nice rendered by Ivan Reis, huh? Although Nicola Scott makes her look really good on the insides of the book each month as well. Are you enjoying Earth 2? What do you think of our new Hawkgirl? Image: Earth 2 #7, 2012, Ivan Reis. Next Savage Hawkman Writer Revealed! Fabian Nicieza will be scripting Savage Hawkman, at least for the time being! 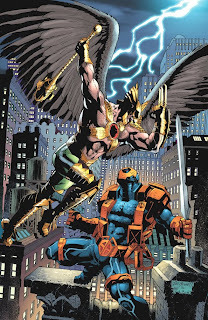 • Hawkman is a fugitive — and everybody wants to kill him for his Nth Metal Armor. Good thing Carter's always ready for a fight! --As I mentioned, Fabian Nicieza is credited as scripting over Rob Liefeld's plot. First off -- WOW does that sound like a 90s X-Men comic. Beyond that, this is a good draw, I think. I have not read much of Mr. "Knee-Cheesy" since his run on Red Robin a few years back, but I really enjoyed that book so that is something. He was part of the New 52 with the launch of Legion Lost, but he exited the book citing time conflicts with two non-comics gigs he has. I don't know how much of that is true, and honestly, it's speculatory anyway. --"Hawkman: Wanted" is still going down. It would seem that the crossover with Deathstroke is still going down, and Slade will still be appearing in Carter's book as well. And man, does the clash between the two on the cover look brutal! -- The art team of Joe Bennett and Art Thibert (at the least) will stick around, which is fantastic as far as I am concerned because the book has looked beautiful the last few months. So what does this all mean? I suspect that Nicieza will be pinch-hitting until "Hawkman: Wanted" is finished. After that (whenever that is... Liefeld never gave us much indication of how long that story was going to be running), we will find out who the next writer and possibly art team will be on the title. Given Nicieza's stated reason for leaving Legion Lost, I don't think this will be a long term gig for him. Secondly, I am just happy as a clam that the "Hawkman: Wanted" story will be continuing. Say what you want about Rob Liefeld as an artist or as a person, but I was enjoying the story he was telling in this title. It was exciting and action-packed, and the broad strokes we have seen so far have really captured my attention. And hey, maybe the character Pike will be a little differentiated from Deadpool under another writer's pen! Thirdly, the art team stays the same! Nothing much to say here other than "Yay!" I'll be back later with the Earth 2 solicitation, but for now let the conversation begin: What do you think about Fabian Nicieza handling the scripting on Savage Hawkman? Image: The Savage Hawkman #15, 2012, Joe Bennett. DragonCon! 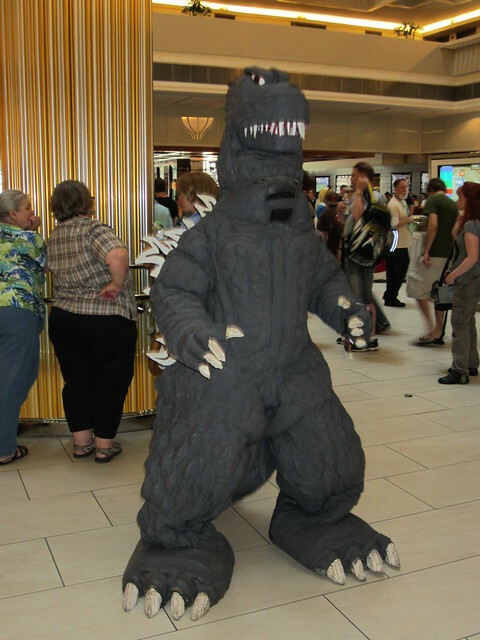 That most mysterious of Cons (to me, anyway) where the main draw seems to be taking pictures of people dressed up in crazy costumes! And this year was no exception, as fellow blogger Shag (he of Firestorm Fan fame) took hundreds of pictures of the cosplayers at the show, including a few featuring our favorite Winged Wonders! 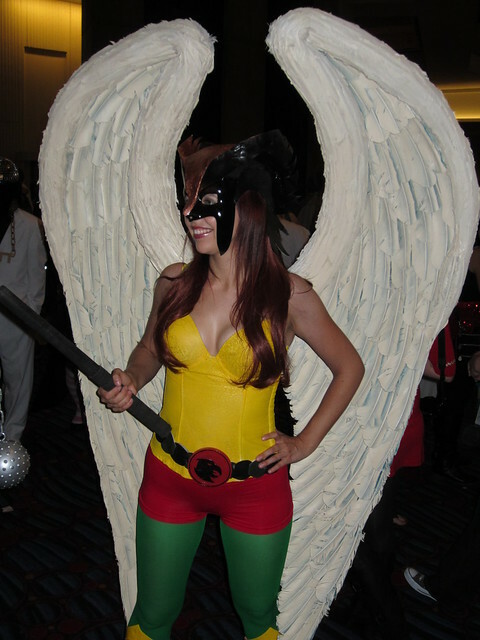 This Hawkgirl cosplayer looks like a Silver Age Shayera mostly from the fact that she is smiling! The combination of the hair and the grin for some reason makes me think of Flo from Progressive Insurance dressed up as Hawkgirl, which is several layers of strange, even for me. I like the hot pants over the green leggings, and the belt is a nice touch, too. The broad, angelic wings are the best element though. Great stuff! 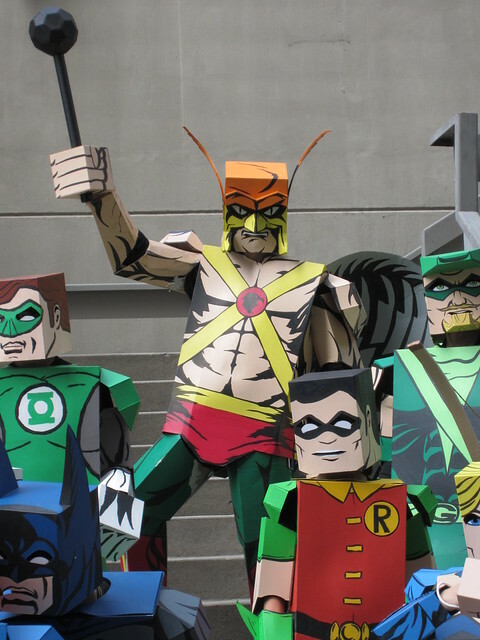 A new trend which has been emerging has been "box heroes," which is heroic costumes which look for all the world like they are dressing up as Mini-Mates. Hawkman got in on that! 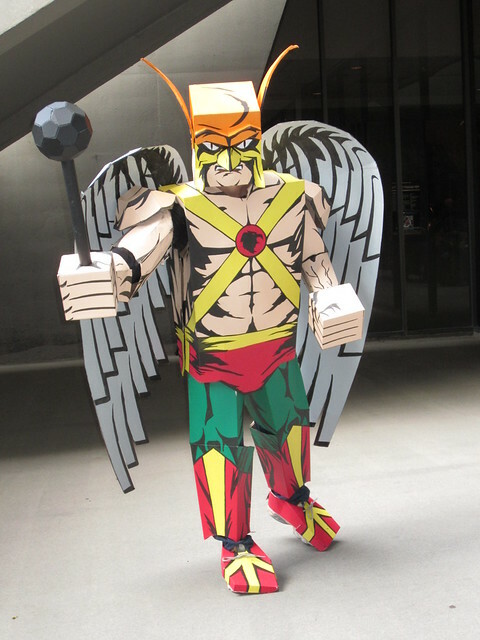 No, seriously, I have the Hawkman Mini-Mate and this is what he looks like. I don't know whether to applaud the craftsmanship or just stare. The mace is awesome, and I lobe the Kubert-esque shading on the, ahem, musculature on the chest. That's right: standing taller than Batman and Green Lantern and about to club Green Arrow in his blocky skull. Yeeeeaaaah. Want more Box Heroes? Shag has a ton of em! As always, there was a photo shoot with all of the DC cosplayers. I am not sure if there are any Hawks in this picture, but check out that sweet Killer Moth on the right! The Metal Men are pretty sweet as well. You can check out Shag's entire DC Comics photo collection right here! An episode of Earth Destruction Directive is about to happen and I wasn't even there! Insane! BIG Props to both Shag for taking the pictures and the Superhero Costuming Forum, who organized a lot of the massive shoots! It's not just me! 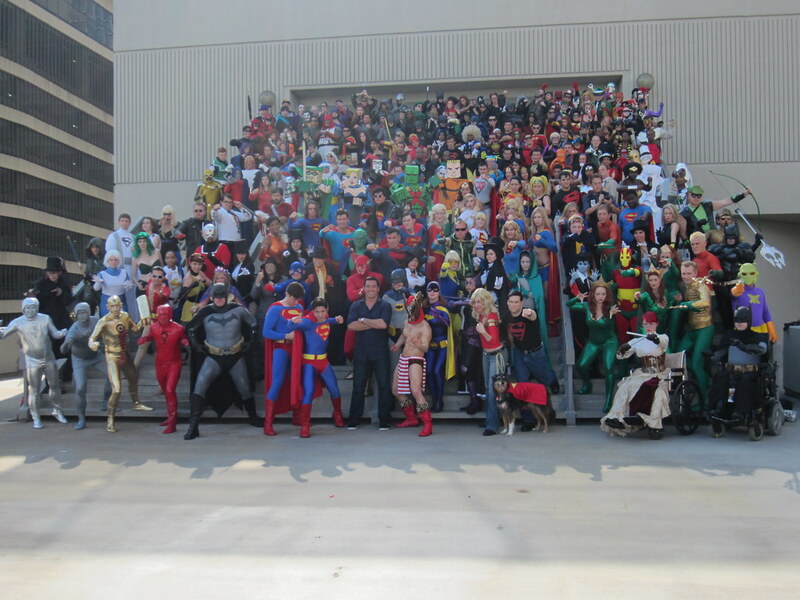 There's a whole gaggle of DC Comics bloggers posting pics from DragonCon cosplayers today! Check out the list below and give em a click! We're back with another installment of the "Hawk family" from NightwingTAS' proposed Hawkworld TV series. Gee, I wonder who this week will be? After Hawkman, of course up next is Hawkwoman. The two just go together, like peanut butter and bananas. (What? It's tasty.) As a character rich in both comics and animation history, Ms. not-just-Hawkman's-sidekick is a character who has come into her own in the last decade. Let's get to know this new version of our favorite feathered heroine. "Once she returned Shiera Hall embraced her true love, husband and soulmate Carter Hall. Shiera returned with a unique perspective, just as Carter recalled all of his past lives, so does she, but she also recalls her time bonded with Kendra, but not the emotions. Shiera does not know that Kendra herself was falling in love with Carter. " I really like keeping the setup from the end of Blackest Night and the whole of Brightest Day. Long time readers will recall that I gushed like an MSNBC operative at the DNC when Shiera Hall was resurrected, and salivated at the potential of that pairing. Brightest Day delivered on that promise, and so I as such I would not object to more of that particular pairing. The overall design is clearly based on her Justice League appearance, albeit with a more severe helmet, and adopting Shiera's resurrected look, with the straps across her chest and the midriff baring shirt. I was never crazy about that particular get up -- the straps combined with the belly shirt form an odd jumble of lines -- and this look doesn't really change my mind for it. Her breasts look a little squished, for one thing. I think either/or would have been alright. Kendra wore the belly shirt and looked fine, and if Shiera wore her normal costume just with the common design element of the cross straps, it would have been fine. All things considered though, it's a snazzy design for Hawkwoman and one which would look great streaking across the screen smashing baddies in the head. Be sure to check out the other "Families" posts today, and come back this time next week for another installment! 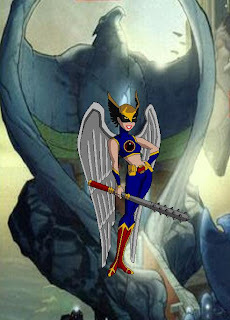 Image: Hawkwoman, 2010, NightwingTAS, Image Retrieved from Super Buddies. Newsarama: Savage Hawkman "On The Bubble"
Pessimism abounds across the 4 Color corner of the Internets when it comes to Hawkman, and it continues in the wake of Rob Liefeld's sudden departure from Savage Hawkman. 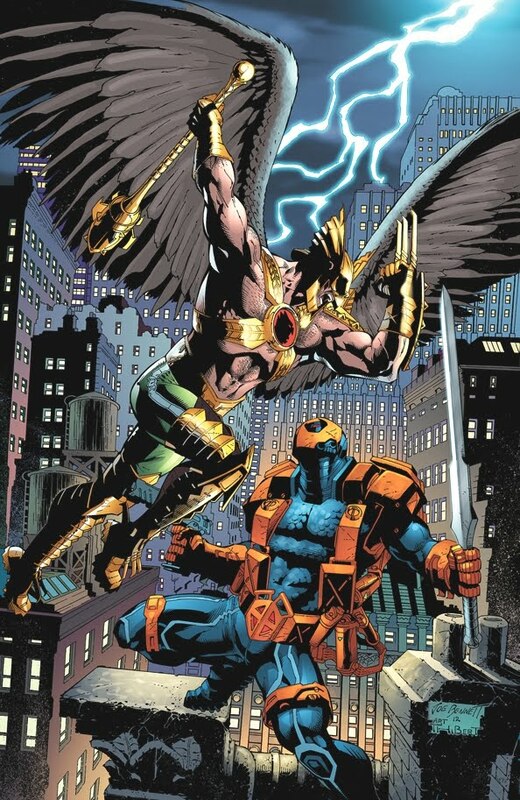 Like Deathstroke and Grifter, Rob Liefeld was brought on board The Savage Hawkman -- a series that was already struggling -- in a move intended to bring more readers to the book. Still wondering how DC thought that Rob Liefeld was going to bring readers to the book. Let me put it this way -- I read the title because it starred Hawkman, and I was willing to give it a try because of my appreciation of the character. Rob Liefeld did not entice me to buy the book. Now, Rob is a guy who can sell his work, and has his fans -- but said fans, while vocal, are no longer legion. Liefeld has departed Hawkman (and his other two DC titles), and thus far, sales have remained to be among the lower echelon of The New 52. With the future of the book post-Liefeld not entirely clear and Hawkman a main part of the new Justice League of America series, it's possible that his solo series might be one of the next New 52 ongoing titles to go. Also included on the list are the other two former Lefield books, Deathstroke and Grifter, which I won't really miss on either front. No surprises there. Firestorm makes the cut, which is also unsurprising, although I hope that the new direction brings in some new readers as Jurgens seems well suited to these types of characters. And topping the list of course is GI Combat, and sadly, even I can't argue with it. I am really enjoying the Unknown Soldier strip, but the lead feature of The War That Time Forgot by Krul and Olivetti is boring, and if a War That Time Forgot story is boring, you have a real problem. What do you folks think? Will Savage Hawkman survive the next round of cancellations? "Here is the beginning of my Hawkman Family set. Carter Hall is the latest reincarnation of Prince Khufu. The Priest Hath Set had murdered Khufu and hiis love Chay-Ara with a knife made of Nth Metal which is also responsible for their perpetual reincarnations. Through the Nth Metal the two's souls are forever bound, to reunite, and fall in love. With full knowledge of his past lives Carter tried to reach his love's soul inside her niece Kendra, and just as she was opening up and falling for Carter they are plunged into the Blackest Night. During the Blackest Night Sheira was brought back and given a second chance at life." Pretty much a streamlined version of the Post-Crisis Carter Hall, removing some of the more wonky bits such as being reincarnated in Katar Hol's body. As a high concept, it works very well, which is what I say to people who routinely call Hawkman too convoluted. Taken as a whole, yes; but stripped down to the basics, he's not bad at all. The look is quite nifty as well, incorporating the typical pouch belt which Rags Morales used a lot in Volume 4. Not sure how well that would animate, but if Black Canary and Zatana can have their fishnets then Carter can have his pouch. The model is shown with his morningstar, but I presume that in the series we would see him armed with other weapons, yes? Be sure to check out the other posts in this series today! Image: Hawkman, 2010, NightwingTAS, Image Retrieved from Super Buddies.